An essential resource for local and central governments that are exploring clean air zones, low emission strategies and other air quality management actions to tackle the impacts of air pollution. 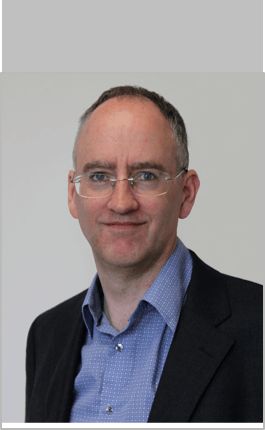 Ricardo has an ongoing programme of measuring real-world driving emissions in England, Scotland and Wales. This work has enabled us to build a unique database containing over 250,000 individual vehicle emission measurements – the largest database of real-world emissions information in the UK. These measurements have been taken in a variety of conditions and have been carefully matched to comprehensive vehicle information databases. The measurements provide an unprecedented level of information on the real-world driving emissions from a very wide range of vehicle types on UK roads. The database provides a comprehensive insight into the nature of real-world driving emissions, taking account of many of the important differences between fuels, technologies, driving conditions and environmental factors such as ambient temperature and road gradient. There is growing evidence that emission factors used widely across Europe underestimate real-world driving emissions leading to uncertainties in the figures quoted by manufacturers. Of particular concern are the emission factors and inventories for oxides of nitrogen (NOx). These uncertainties are not only manifest in the absolute rate of emissions from vehicles, but also in the relative differences between vehicles. Air quality modelling, which relies on accurate emissions factors, propagate inaccuracies and uncertainties into predicted ambient concentrations, potentially resulting in air quality assessments and policy decisions that are not representative of the real world today or when considering future year predictions. Ricardo’s database helps to minimises uncertainty, helping to focus attention on parts of the vehicle fleet that offer the major opportunities to reduce emissions and improve air quality. ‘Ground truth’ emissions information across a wide range of vehicle types. Remote sensing data represent real-world driving conditions for vehicles driven by real drivers. Alternative emission factors for modelling and inventory development. The data can be used to provide grams per km estimates of emissions that are consistent with the COPERT model and provide more detail where necessary. Detailed source apportionment information to quantify the contributions made by different vehicle types and technologies. Source apportionment information provides the data necessary to quantify the contributions to total emissions by different fuels, vehicle types and manufacturer models, etc. Insights into the effects of emissions deterioration based on actual measurements. For passenger cars, the Ricardo database provides a record of the mileage of a vehicle based on its last MOT test. This enables mileage and age-based deterioration effects to be quantified. The data can be used to model different scenarios of direct relevance to clean air zones and other air quality management strategies (e.g. restricting vehicles by Euro emissions standards, fuel type or age). Information to support scenarios testing from the detailed treatment of emissions through to inputs to dispersion modelling to quantify the impact on concentrations of pollutants such as nitrogen dioxide (NO2). 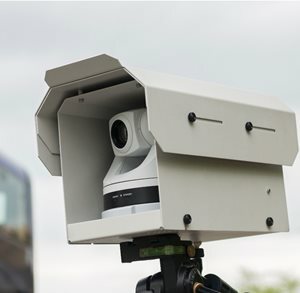 The potential for refined emission calculations based on local authority automatic number plate recognition (ANPR) camera data. Camera data provides a direct measure of the vehicle fleet in terms of vehicle model and age, which can be matched with the Ricardo emissions data. A unique data set that supports the tracking of policy progress in reducing real-world emissions over time and the estimation of future impacts based on projected fleet mixes. 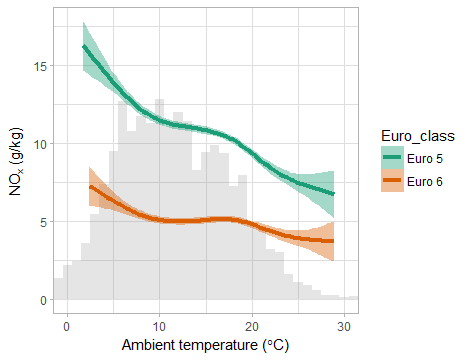 The Figure below shows the effect of ambient temperature on emissions of NOx for Euro 5 and 6 diesel passenger cars. The below chart shows emissions of NOx from heavy duty vehicles of different weight categories, shown by Euro standard. Read the latest analysis and insight from Dr David Carslaw on real-world vehicle emission measurements.